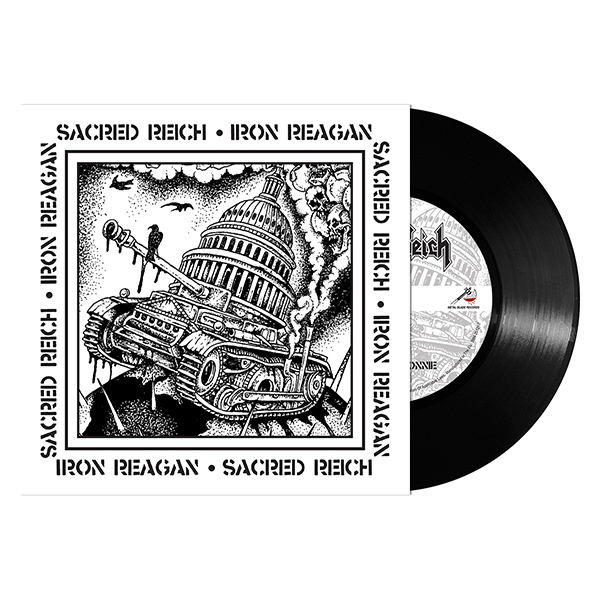 SACRED REICH / IRON REAGAN - SPLIT (LTD EDITION 1000 COPIES BLACK VINYL) 7"
Limited edition 1000 copies black vinyl includes 2-sided insert. We are stoked to do a split with Iron Reagan. When we began as a band in 1986 we were influenced lyrically by punk bands and the Reagan era. This is a great way to get back to our roots. The song is a heavy and cheeky middle finger to the politics of today. You'd think we'd have learned by now. There is a reason our first record is called 'Ignorance'.